$5135 of food and supplies donated so far! Ok, what's this all about? Follow your nose! It's all there to see recorded on the block-chain. Everyone has a name, take the time to introduce yourself. A bit more of the backstory. It was 2014, I was about three weeks deep into Bitcoin and listening to a podcast about a charitable digital currency. It was a turning point in my life and the start of a journey into the Bitcoin world from a altruistic stand point. To me tracking the flow of money sent to an entity for distribution has always been a stumbling block after donating. Where did my few dollars actually go? Using a visible public ledger is quite logical when it comes to tracking donated money, using some form of crypto currency sure made sense to me. I really got hooked when I discovered the ability to micro-tip digital currency via tweets, it was a neat feeling to be able to give money to people even if it was fractions of a penny! I gave away millions of digital coins as a result and really enjoy the thought that some of those accounts will turn out to become quite lucrative as crypto continues to grow in a positive direction. As time passed and distance grew from the charitable community I came to know, I found myself looking at crypto from a much different perspective. I was much more focused on trading, to the point where it was consuming my free time so much I had to re-evaluate how I was living my life. I stepped away and I sold everything... helped where I could with family and just observed from a distance. Burnt out for the most part I was lucky to be able to help moderate a fun community for Ubiq which kept me interested in this world of digital currency during this recovery time. I must admit, finding a way to contribute in a keyboard world is hard for a hammer and nail guy, but in the back of my mind I have always wanted to give it a shot. I had so many thoughts on how to go and add something of value to the community and I kept circling this idea for random small acts of kindness. I often look for signs and wait for solutions to present themselves when it comes to navigating my life path. 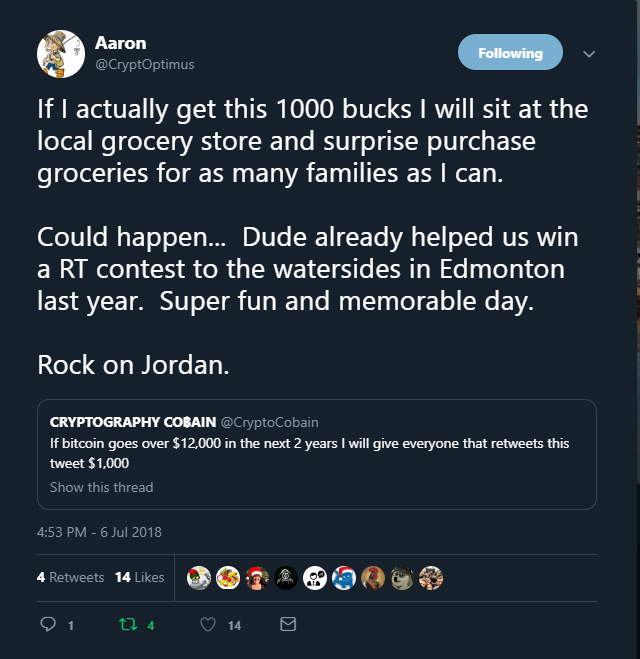 That cheeky reply to a tweet turned into one of those moments when I discovered more than .21 btc or $1900.00 CAD was raised for the grocery tweet! A few days later on a sunny afternoon the kids and I went out buying groceries for dozens of people at our local grocery store. 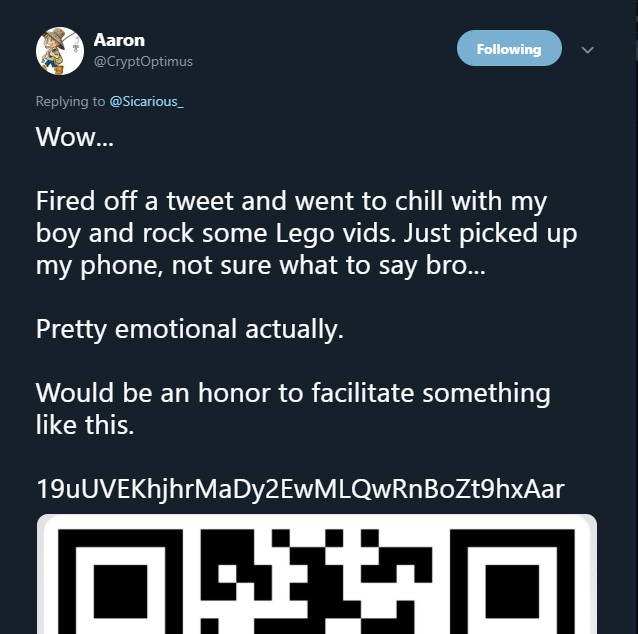 We also decided to start posting these random acts of kindness on Twitter as a fun way to share our experiences because the response was fantastic. It actually led to a further donation of .215 btc! I decided to run with this and create a dedicated site to track the distribution of the money people have trusted us with. It is an absolute honor to have a complete stranger give you a substantial amount of money to distribute and in my mind, those people should have the right to see exactly how that money made a difference. So here we are at my web page... I promise it will get better with time and invite you to join my family on this amazing journey. Lets surprise some randoms with good deeds, small gifts and maybe we can all be a little less grumpy while running around on this rock. "So now what? I send you some Dogecoin or something and someone eats?" Yup! If you want... Feel free to suggest a creative way to perform some random acts of kindness with that donation while we look for opportunities to present themselves. We call them RAOKs... and by we... I mean JUST ME! Maybe include your TXID with communications and we will do our best to accommodate those imaginations. So far it is just my wife and kids contributing our time to distribute donated funds and it has been a very rewarding experience. One day we hope to have a large network of RAOKstars out there. Thus far we have been using Coincards.ca to purchase gift cards in both physical and digital form. The idea is to keep the amounts under a few hundred dollars and try to bring a little joy to people when they least expect it with random acts of kindness. So far we have bought groceries, books, toys, school supplies and gas for two hundred people! We also thought it would be awesome to share the results of your kindness with the world using social media. We hope to post pictures, video and even hand drawn renditions of our experiences encouraging others to join the cause and be kind to each other. It's easy to be a RAOKstar with a few dollars, it does't even have to involve money when you think about it. It's a way of thinking. Nothing would please us more than the ability to keep this idea growing and have a next year! Our funding levels allow for a few more events and we look forward to the opportunity of many more. Speaking of more, how bout another chart? Ok that chart was amazing I know, lets keep scrolling and check out some pics! Some of our recent tweets listed below for your convenience!